Huawei, the world's third largest phone maker, is about to introduce not one, not two, but three new phones in the near future, likely by the end of March. The Huawei P20 and P20 Pro are expected to become the company's 2018 flagship phones, while the P20 Lite should be a more affordable phone that will carry over only some of the innovation that the company shows in its flagship series. But what would the P20 and P20 Pro look like, you wonder? Ask no more: German leakster Roland Quandt has gotten hold of the full specs and official renders for all three new devices in all of the colors that are coming up. Talk about spoiling the show. Well, we're the impatient kind and we don't mind much, so let's take a look what Huawei has in store for us in 2018. The flagship Huawei P20 and P20 Pro are clearly influenced by the Apple iPhone X: there is no going around that prominent screen notch at the top that is even styled in a manner similar to that of the iPhone. 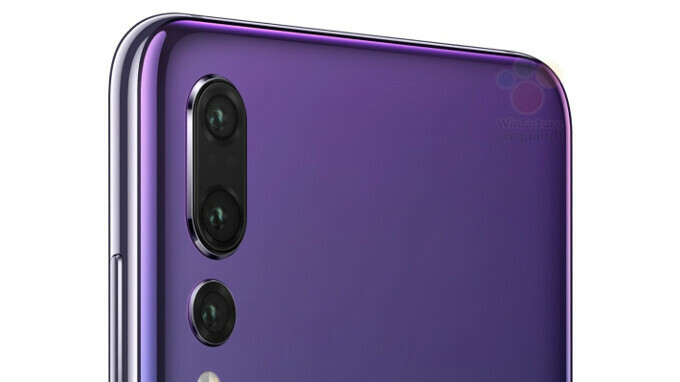 Look at the back of the phones, and you will also notice that first in a Huawei phone, the new camera systems are in a vertical position, another feature borrowed from Apple. This aside, the phones look very well made, with a glass back and a stylish appearance. First, let's start with the similarities: while the P20 Pro will be larger, both phones will share the same aspect ratio of 19:9, a taller and narrower screen. The resolution is set at 1080 x 2240 pixels. Then, under the hood, Huawei's own Kirin 970 chip will power the show and boast a top clock speed of 2.4GHz. One thing these phones will not have is a microSD memory card expansion slot. Instead, there will be a dual SIM card tray. But the key new features will be on the back of these two devices: we are talking about the camera, of course. The P20 will sport a dual camera setup, while the P20 Pro will have a third camera that is likely to be an 80mm telephoto lens, the longest ever on a modern smartphone. The P20 will be available in three colors: black, blue and pink-gold, while the P20 Pro will be offered in black, blue and lilac. In terms of battery, the P20 Pro will understandably have the bigger one at 4,000 mAh, while the regular P20 will feature a 3,400mAh cell. The P20 Pro will also have an OLED screen, while the P20 will feature an LCD display. The most affordable phone of the new series, the P20 Lite will be available in three colors - black, blue and pink - and it will also have a notch, but the bezels around the screen will be slightly larger. It will feature a glass back and a look somewhat similar to that of the Honor 8/9. Finally, the prices of the new P20 series will be clearly in flagship territory. Since the phones will not be available in the United States, the prices below are listed in euro (usually US prices are the same as the ones listed in euro, though). There is no word on the release date of the phones, but chances are that they will launch to the public in April 2018. Pass! If I wanted people to think I bought an iPhone I'd buy an iPhone. No because Essential's notch is smaller and circular while this one resembles the notch in iphone which is wider and bigger. He wasn't saying that iphone was the first one, he is saying that Huawei copied iphone style notch. Oh god how can it looks like an essential phone? Yes both iphone X and essential have cutouts but both of them have different cutout shapes and purpose and you can clearly see that Huawei is trying to emulate iPhone X design. Chinese iSheep will buy it. Copping this type is design is a sign of laziness. I can't waste my money on it. The pro version of this phone with its 80mm tele lens and its 4000mah battery is gonna be so much better than anything that Apple and Samsung can offer! It's will cost around 1000$, many people don't have so much money to spend on a phone. If you prefer tele lens just buy a LG G6/V30 and get a discount of a couple hundred dollars. Those are wide angle lens. Telephoto lens gives you lossless zoom. Is there going to be capacitive back and recents keys with home button, or is it going to be a fail like the Motorola phones with on screen nav buttons? EMUI allows you to choose between on screen buttons and capacitive through the home button/fingerprint sensor. Long press for home, swipe left or right for recent and tap for back. Meanwhile I won't be upgrading my P10 to this. Not only because I hate notches but Huawei updates on my P10 have been pitiful. I'll wait and see what the Mi7 offers. You'll be surprised how many people hate rear fingerprint scanners, too. Beautiful phone. Too bad there is no micro SD card slot. Might have to pass on this one. Loving the two tone color of the p20 Pro.